Zhongguancun Software Park as a national key software industrial park industry, at the same time, the next five years is an important period for the development of China's cloud computing industry, should be based on the cloud computing base (Center) to drive the demonstration and application of landing, provide good business opportunities for the enterprises in the cloud computing industry, promote the rapid development of China's cloud computing industry; the leaders of the the awarding of alliance members expressed congratulations, and hope that they can lead the cloud computing industry cluster, accelerate industrial application development. 1 centralized management of the construction of the storage system, so that the storage of resources in the server to fully share, while reducing the complexity of storage management. The main storage system construction according to the 2 VM virtual machine operations mainly concentrated, high configuration of high stability and high IO high performance storage system to meet a large number of VM virtual machine, efficient and reliable operation and meet the future expansion of VM virtual machine business. A set of 3 recommendations to fully protect all local users to use the shared memory of SkyDrive, but also can meet the future external users upload, file sharing permissions and other network file sharing service and can meet the demand of storage mainstream storage virtualization technology, reduce the storage capacity of SkyDrive users a lot more purchasing. 4 construction of a safe and reliable high availability system, so that the whole application system to avoid the single point of failure caused by the stop service, while improving the performance of the application system, increase the reliability of the system. Application of 5 storage system construction with high data protection or future remote disaster recovery function, through the data copy Archive Construction of remote disaster tolerance system, application system by the recovery operations in the event of a failure problem, remote disaster recovery function can be realized at the same time, further upgrading of the future system. With the rapid development of storage technology has been developed from different storage architectures DAS, NAS, SAN to the current popular IP SAN FCOE and some new technology in the traditional business model and business server is usually each application system is completed by a server, the relative resources and application of relatively fixed correspondence these resources belong to all business departments. Usually the server resources occupied by these services are only about 10%, and the rest of the processing resources and power resources can not be fully applied. With the development of new business application layer of new technologies, such as mobile phone business application terminal, video download, personal data management, video sharing, remote backup, disaster recovery, billing management and infrastructure management needs more and more server system operation, the development pattern of enterprise can not choose such a relatively fixed, if the use of all of the existing resources to fully meet the needs of business development. According to the following scheme, the innovation division recommends the new generation data center system under the development of new business. Pictured above is shown in a set of topological configuration storage platform system composed of structured data, a data storage system and the storage system, the front end server provides storage service, the server running VM virtual machine in the storage space, through multiple virtual machines to provide different services forward end of a variety of business systems. UIT innovation recommended SV5000G2 and UFS and SV3000G2 memory to achieve the current VM virtual machine application and SkyDrive applications. In this set of storage can achieve data storage virtualization, data replication, snapshot, or personal file storage server upload documents, SkyDrive users access settings, VM service automatic switch and a full set of safe and reliable storage function, and meet the future realization of remote data backup. Through the remote disaster recovery function realization of virtual storage virtualization technology, through remote synchronous or asynchronous replication provides remote data synchronous or asynchronous disaster recovery service to key host application server. Each system can provide the host channel for the front-end business hosts, to provide up to 400 thousand IOPS and 1500MB/s properties can meet the existing variety of business applications such as Web database, high flow and high bandwidth business needs, at the same time the back-end disk cabinet can still use high performance SAS hard disk, and FC hard disk, internal transfer rate more high, but the price is reduced by half. If the enterprise already has other brand high performance fiber optic storage system only needs to access the storage system to carry on the unified management not because the storage system affects the original storage system performance. Provide a storage server for the main business system by VM and SV5000G in the scheme, choose the stored SV5000G2 Ethernet interface is not only convenient for network deployment, but also equipped with a FC 8Gb host interface and IP interface is mixed use, to meet the different needs of the business and provide the flexibility of use. Through the deployment of virtual machines, the deployment of SkyDrive business systems in the SkyDrive store can fully meet the business needs of VM virtual machine on SV5000G2, and the SkyDrive store business needs to support a variety of user access and authentication encryption transmission. At the same time VM virtual machine server if the fault can be the first time the virtual machine to switch to other servers, such as storage, link failure through the dual controller and multi link can effectively switch. The innovation of SV5000G memory to achieve a large number of users of the VM virtual machine operation scheme is recommended, SV5000G storage system using hybrid port, to meet the needs of the business according to the different choices of different types of business. 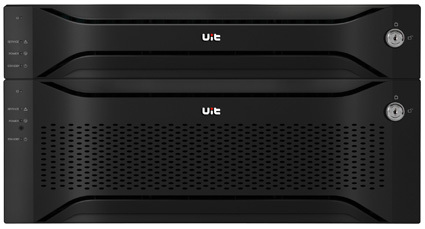 SV5000G2 supports a variety of RAID level, RAID3 RAID5 support RAID1 RAID6 and other levels, as well as online backup disk support, and SV5000G configuration of the dual controller architecture that runs on Active and Active under the double live mode effectively protect the safe operation of the system reliability. The proposal is recommended to configure 2 SV5000G to support such a large scale VM virtual machine business applications. The program also suggested the configuration section in SV5000G2 SAS hard disk, SAS disk with high reliability and high stability and high performance can fully meet the needs of all business database system on the VM and other service applications demand high performance and high efficiency. SV5000G2 through the Ethernet and the front switch connected to all the servers connected through a simple configuration can be used to store all the storage space. The deployment of SV5000G2 VM not only solves the problem of storage, but also brings some advanced features, SV5000G2 thin provisioning can use all the storage space according to "how much storage space for many of the principles. 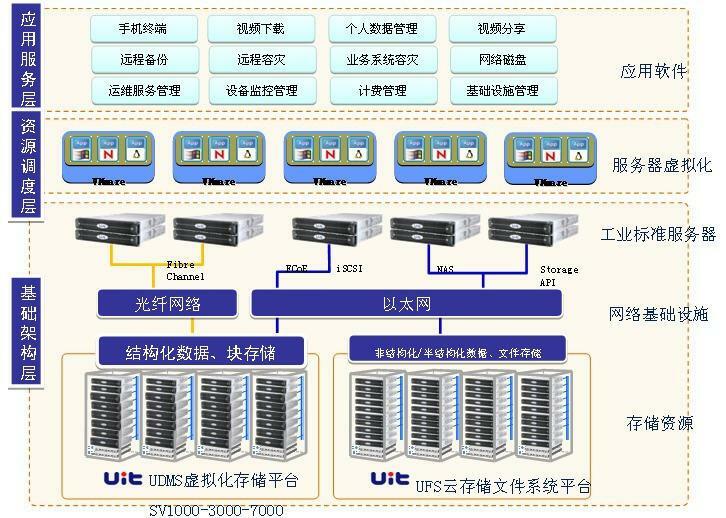 Through this project SV5000G2 technology can store virtual space in the coming years, the 100T VM virtual machine storage space for the purchase of virtual 1P or more, the deployment of future system upgrade to avoid once again adjust the front-end server space caused by insufficient capacity. It is also the first time to use the snapshot function to store the data in the store based on the time metadata. The data security can be fully protected by this kind of backup method. According to the current demand and SkyDrive scheme for the VM virtual machine to get more reading and writing performance of recommended the construction of a SkyDrive storage system and VM virtual machine business storage system formed a complete set of storage system. SkyDrive storage system also supports virtualization technology for 20G provisioning storage space for each user to provide the storage system can be realized by virtual way. Use only part of the storage space can get more user space usage right. SkyDrive storage system is also running a SkyDrive software, it can help the front-end VM server provides fast file storage service is safe and reliable, and help enterprises from individual users whenever and wherever possible document management, staff and external to the enterprise, whether it is at home, or anywhere else, as long as you can connect to the Internet. Convenient and safe management of files stored on SkyDrive remote data center, is stored in the local file management, and implementation and other users of file sharing. Business users can use SkyDrive to build a private cloud, the employees desktop data protection, and provides network storage space, improve the convenience and safety of access to the file. At the same time, the paper also can be in the enterprise to facilitate the sharing of a team or individual. For operators SkyDrive can provide personal public cloud storage services for the Internet, convenient operation and integration, and can be based on the capacity of network users grows fast and dynamic expansion. Project UIT recommended a SV5000G2 based data storage, virtual storage system provided by SV5000G2 platform for the park, in the virtual storage platform, the user may need to run your own server virtualization platform and application system. The data storage space at the same time using cloud storage system USpace as the key data of every business park based on the cloud, so that the park from the host virtualization to storage virtualization and application of key business data or personal success in the cloud, the cloud storage provides based on cloud computing landing most mainstream solutions for the enterprises in the park. Zhongguancun software park is good for IT services, and effectively solve the enterprise IT needs, through the operation service platform is easy to use to business service and storage space, the establishment of cloud platform Industrial Park to provide a safe and efficient, stable reliable information sharing and service platform for data backup. Of course, this is just the beginning of cloud storage play a role. The Zhongguancun software industry as the leading building, with enterprises as the mainstay of the service platform, to enhance the park's overall strength in science and technology, promote the rapid development of the park, to cultivate more have the ability of independent innovation, with core technology, has important strategic significance for good growth companies.